Good Morning Blues and welcome to this game day edition of news updates from CFCnet, where we take a look at the latest news, transfer rumours and anything else surrounding the Stamford Bridge club. As Chelsea prepare to take on the in form Tottenham, it would appear that the Manager is still having doubts about a certain few of his players despite some much improved performances from key players in recent matches. “I like a number 10 to score goals. I like a number 10 to get in the box. I like a number 10 to score a goal like Oscar did against Maccabi Tel Aviv. A number 10 for me is an eight-and-a-half when the team loses the ball and the number 10 is a nine-and-a-half when the team has the ball. 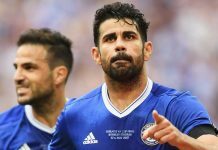 Meanwhile, it is becoming apparent that Mourinho and Chelsea are also losing the faith in Diego Costa after a poor season so far scoring just once in the last 7 games. It was reported that the Spaniard has two weeks to prove his worth and there is more and more pace gathering behind a possible departure this January. Which is perhaps why there has been talk gathered up regarding potential moves for two England International strikers Saido Behahino and Jamie Vardy. The latter has just entered the Premier League record books scoring 11 goals in a row and even at 28, the big clubs are coming in for him. It has been reported that Manchester United and Chelsea have been told that they will need to pay £30 million if they want to sign Vardy, whilst Berahino could be an easier option for the both of them. Also, Striker Alex Teixeira from Shaktar Donestk is also still claiming that Chelsea are in talks to sign him, so we will see what becomes of that one. Mourinho has stated that Chelsea will not be looking to do any business in January, but we all know that when he says that, he means the opposite!